Apple this week offered a preview of features in the upcoming release of iOS 9.3. Those features include a range of consumer enhancements, including Night Shift, a viewing mode that minimizes the output of blue light that can disrupt sleep patterns; significant improvements in the iPhone's health tracking capabilities; the ability to secure notes; and improvements to CarPlay and the iOS News app. The most significant changes, however, are aimed at the education market, though it's likely those changes will eventually reshape iPad use in the office and at home. The advances in education capabilities come as Chromebooks are making massive inroads in K-12 education, a market Apple has largely dominated for years. A new Classroom App that allows teachers to see what students are doing on iPads in the classroom, remotely launch and lock apps, and share student work on a classroom display connected to an Apple TV. Simplified device and service management that allows education IT shops to set up devices, create user accounts, distribute apps and ebooks and build custom courses that can be delivered through Apple's iTunes U. Streamlined Apple ID creation and management that allows bulk creation of student and teacher Apple IDs, local password resets and customized roles for teachers and school staff. Night Shift is designed to reduce blue light from a mobile device's screen in dark environments. The biggest advance is known as Shared iPad. As the name suggests, this feature lets students share iPads and it's designed for schools where cost or policy concerns prevent implementation of a one-iPad-per-student program. Shared iPad allows students to log into an iPad similar to how they would log into a Mac or PC. The result is that a student's apps, content and progress through various tasks will be available, regardless of which iPad they actually use. Apple is working to make this as frictionless as possible by using intelligent data caching. There's also a Photo ID feature that allows teachers to identify the last student to use an iPad, which should avoid delays related to downloading content and could help optimize on-device storage. For younger students, login can require a simple four digit PIN rather than a complex passcode. Regardless of the technologies it relies on to streamline downtime and login, Apple is supporting multiple users on an iOS device for the first time. That is extremely significant because the company has never shown any real interest in making iOS a multi-user environment. Apple hasn't stated this clearly, but its description of the feature implies that these user accounts or profiles aren't necessarily on the device itself: For students who use the same assigned iPad in a class each day, starting a lesson is hassle-free. Thanks to intelligent caching, when students log in they don't have to wait for everything to download — it's already there. That implies that user data is cached on a shared iPad, but that the data could also be downloaded if a student needs a device other than the one he or she has been using. Given the focus on Managed Apple IDs, the implication is that user data is linked to a specific Apple ID created and managed by the school. Shared iPad will be a major advance for schools, because it helps make iPad use a major part of the classroom experience without requiring a massive investment -- and it will be a boon to education IT and teachers. But schools aren't the only environment where iOS devices are shared. 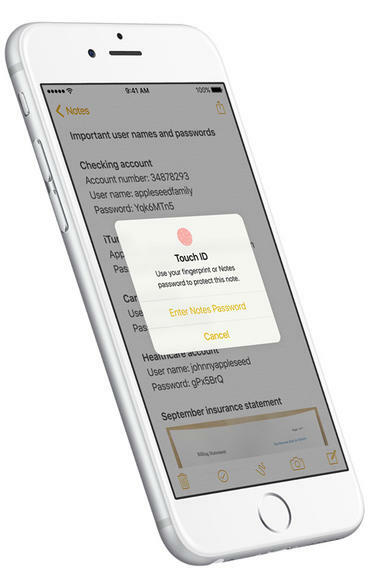 Notes can be secured in iOS 9.3. Many families share one or more iPads (and even iPhones, in some cases). At home, an iPad becomes a multi-user device, albeit with limitations. As things stand now, progress in games, ebooks, education apps and so on isn't delineated between siblings or parents. Access to email, social media, or messaging accounts isn't separated. Access to content isn't partitioned based on user, genre, or age appropriateness. Device and app settings are one-size/user-fits all. A single Apple ID is used across the board for purchases (a second may be used for iCloud features, but again it's just one ID). For families on a budget, buying multiple iPads isn't always an option. BUt sharing a single iPad (or even a couple) isn't always ideal for these reasons. Expanding this ability from the classroom to the living room is a natural extension. So is taking the Managed Apple ID concept from teacher and school administrators and adapting it for parents. Apple isn't there yet, but it's hard not to see where the company is heading. It's also worth noting that this functionality already exists across most mobile a desktop platforms. Android, Windows and Windows Phone have offered multi-user capabilities in one form or another for some time. Apple has, of course, offered this in OS X since it debuted 15 years ago, along with a range of parental control options, all of which could be adapted for iOS. Apple could even take OS X's Guest User feature and extend that to iOS as well. It's hard not to see Shared iPad as enterprise-worthy. Despite the BYOD trend for mobile devices at work -- and the related assumption that devices will be used by a single employee regardless of ownership -- there are a variety of contexts in which a device could be shared. Retail, customer service, and hospitality are prime examples, though they can often work in a kiosk mode where personalization isn’t needed. Other environments like healthcare, sales, field service, architecture/engineering and design are areas where multiple professionals might work with a single pool of devices, but where user-specific apps, settings or content is necessary for effective use. This need for personalization is even more apparent when using the iPad Pro. One of the chief criticisms about Apple's oversized tablet is that its hardware potential is held back by the limitations of iOS, an issue I predicted Apple would tackle in 2016. Multi-user functionality isn't at the top of the list for iOS improvements related to the iPad Pro -- paid upgrades, light versions of apps and better multitasking tend to lead the list. But it is a "pro" feature that would make the device even more valuable. It would allow a company to offer the pricey tablet in a more cost-effective way since a single iPad Pro could be shared among several staff members. The big question with enterprise use of the Shared iPad feature is how far Apple would go in tying into existing enterprise systems. The company's Education Preview page implies that at least some of the management functionality will be tied to Managed Apple IDs and services like Apple's Device Enrollment Program and Volume Purchase Program, though it does reference integration with MDM/EMM software. If Apple supports key enterprise systems like Active Directory, then managing shared iOS devices, including device access and usage logging, could be similar to managing PCs. The very functionality Apple is already implying for education use is essentially the same as Windows roaming profiles, in which a user receives the same Windows desktop and experience regardless of which PC they use. This would significantly expand the versatility of iOS in the enterprise and could be a big step in making the iPad Pro a true competitor to the Surface Pro or other Windows tablets/hybrids. 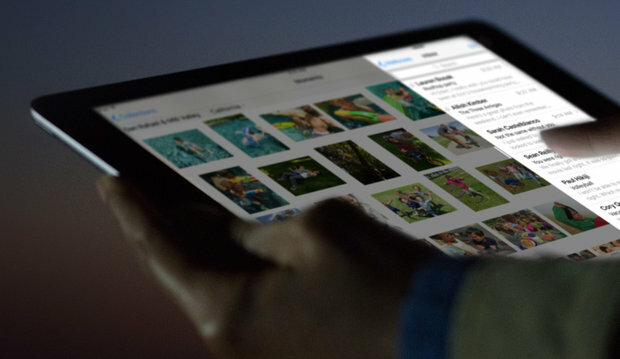 Should Apple move forward with Shared iPad as a cornerstone feature of iOS, it will likely do so with iOS 10. Introducing the feature specifically for education at this stage represents a good testing ground for Apple and a way to reassure education customers that the company understands their needs. If this does become a standard iOS feature, it will mark a major expansion of capability on par with support for mobile management in iOS 4 or Apple's Device Enrollment Program introduced in iOS 7. Whether Apple will move forward with multi-user support, to what extent, and in what form remain unanswered questions. But the idea is exciting from the perspective of educators, consumers, business users, and IT professionals.